The definitive Mexican-American immigrant story, at once intimate and epic, from an acclaimed storytellerIn his final days, beloved and ailing patriarch Miguel Angel De La Cruz, known affectionately as Big Angel, has summoned his entire clan for one last legendary birthday party. But as the party approaches, his mother, nearly one hundred, dies herself, leading to a farewell doubleheader. Across one bittersweet weekend in their San Diego neighborhood, the revelers mingle among the palm trees and cacti, celebrating the lives of Big Angel and his mother, and recounting the many tales that have passed into family lore, the acts both ordinary and heroic that brought them to a fraught and sublime country and allowed them to flourish in the land they have come to call home. The story of the De La Cruzes is the American story. This indelible portrait of a complex family reminds us of what it means to be the first generation and to live two lives across one border. 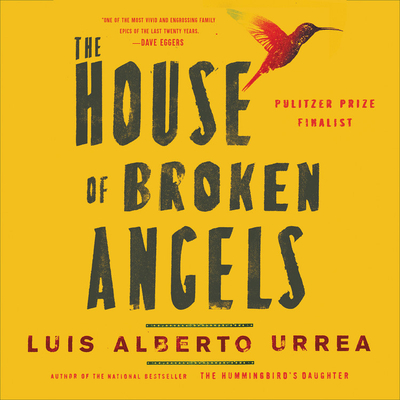 Teeming with brilliance and humor, authentic at every turn, The House of Broken Angels is Luis Alberto Urrea at his best, and it cements his reputation as a storyteller of the first rank.